While a cold glass of Copella or Tropicana straight from the fridge on a hot, sunny morning might hit the spot, nothing really comes close to freshly-squeezed orange juice – and to get that unbeatable taste, you need the best orange juicer. Whether as a self-indulgence or a gift, have a scroll below to find the best orange juicer to suit you, or head to our appliance hub page for more kitchen appliance recommendations. What to consider when buying an orange juicer? Depending on how much elbow grease you’re happy to spend on your morning juice, you can choose between two different types of juicer: manual or electric. It’s a given that electric juicers are more expensive thanks to all that complex circuitry, but if you usually find yourself in a rush, the convenience they offer can transcend the initial annoyance of spending more. The lower level of exertion they require also makes them better for juicing enthusiasts with mobility issues or arthritis, as some manual juicers require you to really put your back into it. When looking for an electric juicer, consider the capacity of the inner reservoir, if it has one, and whether it corresponds with the amount of juice you’ll be needing to press in one go. You also might want to consider the capacity of the motor to handle large orders – that is, will it start to run out of steam or give out a suspicious burning smell after a few minutes of constant operation? If you’re planning on reserving your juicing for the weekend, or time’s not an issue, a manual orange juicer may cut it. We’ve included a selection of manual juicers that forego the traditional reamer (that’s the cone onto which you’d squish the fruit) and opt instead for sturdy steampunk-look stand presses or even handheld models that can be stowed in the drawer. Professing to juice everything from the tiny lime to the extra-large grapefruit all the way down to the rind, this SAGE by Heston Blumenthal number is our best citrus press. The ‘quadrafin cone’ is designed to get more juice out of your fruit, the triple-hinged handle to exert even pressure across the fruit, no matter the size or shape, for a thorough squeezing. Then there’s the fruit holding cup, which means no sticky or waxy fingers from having to hold the orange in-situ. Everything has been thought of in this simple but effective, and undeniably attractive machine, making it our all-round favourite. Forget five a day, this juicer does it all! If you’re stuck for time, this Braun juicer might just be your healthy breakfast holy grail. When not in use, it looks demure and attractive on the worktop thanks to its compact and elegant design, but when it is in use, it’s a beast. It exerts up to 800W of power on fruits and vegetables alike and automatically separates the foam for a beautifully clear juice, so if you get a hankering for something more robust than orange, it’s a good backup to have. Add to that the reasonably quiet operation and the fact that it pretty much sees to itself, and it’s ideal for busy early mornings. This heavy duty, industrial-style juicer is just the thing to make your kitchen countertop feel as if it’s actually the back bar of a bustling coffee shop in some unbearably cool London borough. The cast iron construction means that, in theory, it’s second-to-none for longevity, and this is backed up in practice by happy reviewers, who say that it beats the competition with its battleship-like build quality. Users found it strained out pips and larger bits of flesh, but that if you want a pulpless orange juice, you’ll have to strain it further, however for authentic juice with easy cleaning – the stainless steel business parts are removable and dishwasher safe – it’s a winner. 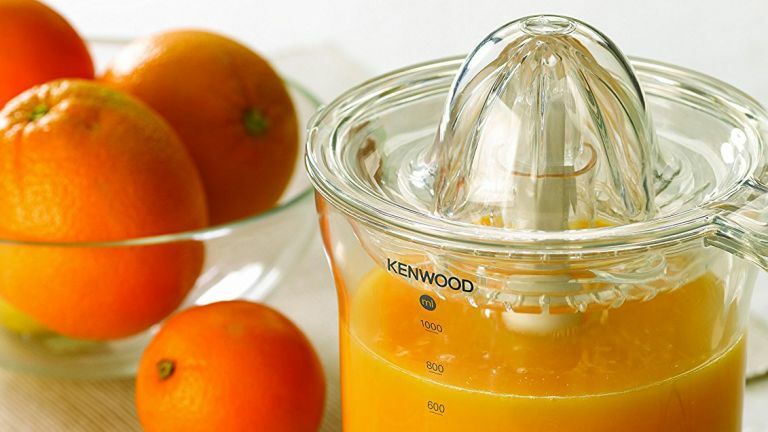 In our opinion, this is the best orange juicer for heavy-duty use. For juicing citrus fruits, this Citri Star juicer looks to be a great all-rounder. Don’t let the lack of a big brand name put you off, because reviewers have raved about its performance, with one owner of over eight years remarking on its consistently powerful juicing, effective filtering and ease of cleaning, with the removable bits only requiring a rinse under the tap after each use and the odd spritz in the dishwasher. One reviewer commented that even as an arthritis sufferer it was easy to use, which is a huge plus. One occasional gripe was that long-time users had trouble with the spout staying put, however spares are available to buy to extend the longevity of the juicer. If your whole family loves orange juice, but not everyone loves pulp, this inexpensive citrus press is already more economical than a few weeks of buying separate bottles of juice from the supermarket. Its big seller is the adjustable pulp selector, which lets you easily choose how much of the good stuff gets through on each pressing, allowing pickier palettes to still enjoy the goodness of juice without extra expense or fuss. Reviewers remarked that while there wasn’t much in the way of instruction, it was easy to use and easy to clean without much guidance. One described it simply as “light, quiet, streamlined and cute”, and we think that sums up its appeal perfectly. You might like the idea of a stationary manual press, but not have the worktop space to accommodate one – if so, this handheld orange squeezer is a great compromise. By their very nature hand squeezers tend not to be ideal for those who have trouble with their wrists or hands, however reviewers noted that they didn’t have to apply very much pressure to get a decent result, and Chef’n say the gear mechanism is designed to reduce hand fatigue. Users commended the quality feel and strength of the metal parts, and loved how much juice (and how few pips) made it through. This juicer has earned rave reviews for its worktop-friendly size, quiet operation and capable motor, all for under £50. Users were impressed by how quick and easy it was to use, and loved that it contained the juice in an internal reserve until it was needed, at which point it could be released by pressing on the pouring spout – no drippy, sticky bits to clean up later. It does require you to press down on the orange half you’re using to get the maximum amount of juice, so if you want a fully automated experience you might want to look at something like the Braun juicer, above, but for a simple and surprisingly fully-featured juicing option, this seems to hit the mark admirably. If you're big on no waste and want to ensure you get every last drop of juice from your oranges, this is the best orange juicer for maximum juice extraction. What sets this inexpensive juicer apart from the rest is its two-way spinning to extract juice – it seems simple enough, but twisting both clockwise and anti-clockwise is enough to get a competitive amount of juice compared to similarly priced juicers. Reviewers found the three main parts of the juicer easy to assemble, disassemble and clean, and loved that the jug was large enough to hold a litre of juice, saving on multiple trips and squeezes when it came to big breakfast parties. Perhaps the only downside is the fact that it only comes with one size of cone, whereas some other juicers come with multiple reamers for different fruits – however if you’re after a dedicated orange juicer, this shouldn’t prove a problem.